Share the post "Rutgers Atmospheric Science Graduate Program Turns 10 Years Old"
L-R: Prof. Benjamin Lintner, GPAS director and associate professor in the Department of Environmental Sciences, Prof. Anthony Broccoli, chair of the Department of Environmental Sciences, and Paul Loikith, GPAS alumnus (’10, ’12) and assistant professor at Portland State University, at the GPAS 10th anniversary symposium held at Rutgers in May 2017. 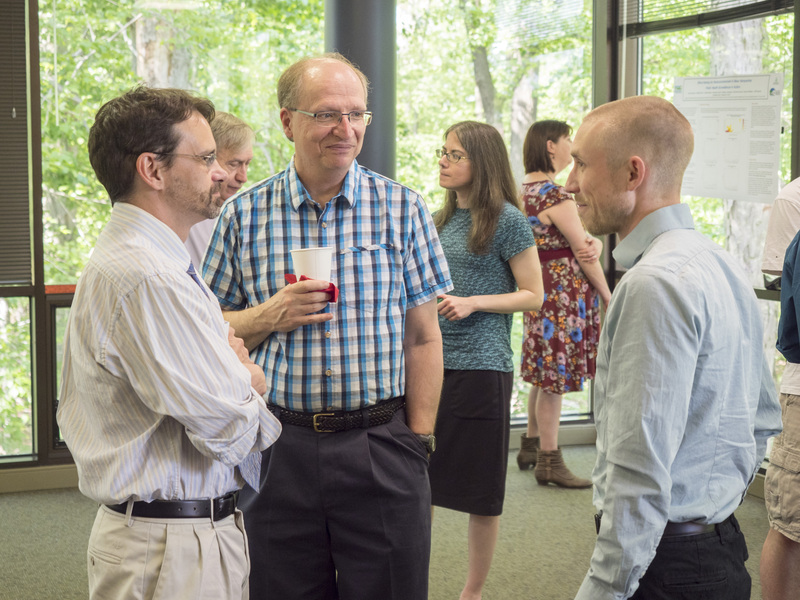 Faculty, students and alumni of the Rutgers Graduate Program in Atmospheric Science (GPAS) marked the 10th anniversary of the program’s establishment with an afternoon symposium held during the Spring semester at the Cook Student Center. The event featured a keynote address by Arlene Fiore, professor and accomplished atmospheric chemist from Columbia University, as well as talks by two GPAS alumni, assistant professor Paul Loikith (Cook ’07; GSNB ’10, ’12) of the Department of Geography at Portland State University and Ben Kravitz (GSNB ’09, ’11), research scientist at the Pacific Northwest National Laboratory. Atmospheric science graduate student Joe Slezak presenting his research poster to attendees at the GPAS 10th anniversary symposium. 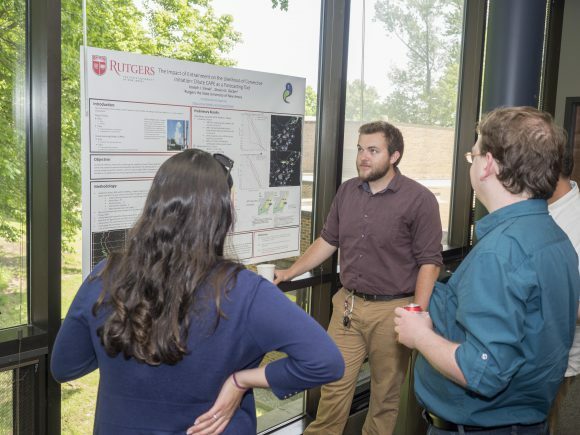 Several current students and alumni also presented posters of their current research at the symposium, with talks and a poster presentation that spanned a range of topics in atmospheric science, including air quality and pollution, and temperature extremes. Currently, GPAS includes 15 faculty across the departments of Environmental Sciences, Marine and Coastal Sciences, Earth and Planetary Sciences, Geography, and Civil Engineering. Since 2008, the program has graduated 17 doctoral students and five students at the master’s level. Lintner stressed that GPAS alumni are employed across a range of academic, government and private industry positions nationwide. He also pointed to the high caliber of current and incoming students. Over the last two years, four students have received SEBS Excellence Fellowships, while one incoming student in Fall 2017 has earned both an Excellence Fellowship and a Presidential Fellowship. Earlier this year, a second-year Ph.D. student was awarded an NSF Graduate Research Fellowship, also a first for GPAS. 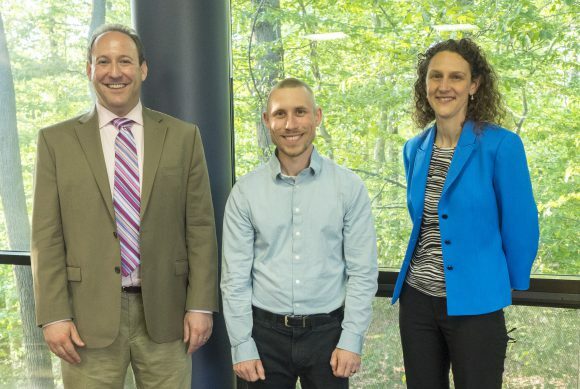 L-R: GPAS 10th anniversary symposium speakers Ben Kravitz (GPAS ’09, ’11), Paul Loikith (GPAS ’10, ’12) and keynote speaker Arlene Fiore, noted atmospheric chemist at Columbia University. Among GPAS’ plans is to enhance its visibility and reputation nationally and internationally. For example, Lintner has begun to explore avenues for developing collaboration as well as research and education exchanges with the atmospheric science program at the University of Sao Paolo, the premier atmospheric science program in Brazil. GPAS will also work to promote professional development opportunities that better prepare graduate students for careers both inside and outside of academic.